It is some time since those crackpot quasi-scientists, the phrenologists, were taken seriously. 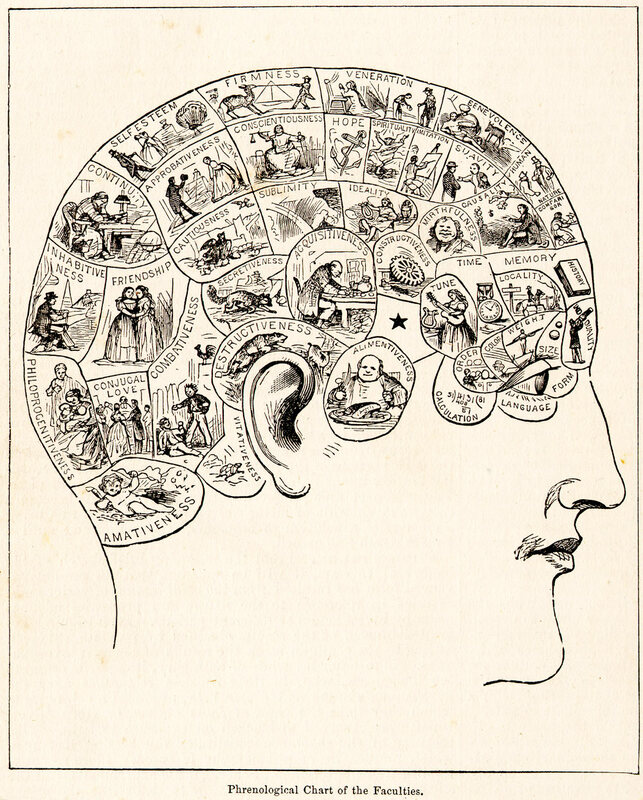 A Victorian obsession, phrenology centred on the concept that the areas of the brain would betray their attributes through an examination of the skull. So you could tell what the brain and personality were – just by observing the pits and crevices of the cranium, using them to calculate the mass of each area of the brain, and thus each personality trait. The phrenological map for the brain is fanciful, to say the least. It puts destructiveness just above the ear, and ‘amativeness’ – arousal – at the back of the skull. And the language area seems to be just below the eye. Nevertheless, man has followed many blind alleys for every medical advance; and in the nineteenth century phrenology held just enough credibility – and fascination – for Miss Charlotte Brontë to harbour a desire to try one out. The author of Jane Eyre had referred to phrenology briefly when she first described Mr Rochester. And now she turned to her publisher and friend, George Smith, to help her gain access to a reading. But if she turned up as the famous author, a reading would be a synch for any crackpot head reader. So she and George hatched a plan. They would go along to phrenologist Dr Browne, posing as Mr and Miss Fraser, two perfectly average punters on the road to enlightenment. The pair were duly read, and studious reports published. Miss Fraser recieved a glowing report. One worthy of Jane Eyre herself. Miss Fraser, Dr Browne continues, is endowed with an exalted sense of the beautiful, and the ideal, and longs for perfection. Perhaps there is something in this phrenology. Or perhaps Dr Browne had glimpsed George and Charlotte on their excursions about the city, and knew their identities all along. But his report about Charlotte mirrors her excellently. And what of Mr Fraser? “The estimate of my own head was not so happy,” he writes in his memoirs. He claims to have sent the original to Charlotte. A postscript exists to this story. For a few days later George Smith ran into a friend who was also acquainted with the phrenologist in question. Posted in Literary livesTagged Charlotte Bronte, George Smith, literary tales, phrenologyBookmark the permalink. charlatains or something real? we have to wonder, don’t we? I’m in the Charlatans camp, Sidey. His analysis was just too spot-on not to be informed. What a delightfully obscure little piece of the story, Kate! How fascinating it is. I like to think that she was remarkable enough to merit an accurate reading that would have pointed to her creative genius, but poor Mr. Fraser must have felt so ordinary! Very interesting Kate, once again! Thanks, Tom. I think sometimes we forget that all these authors were of their time, and took acount of the news and fashions and what was in vogue. Head in hands, I ponder my phrenological fate. Nancy, I would bet my dog on it. It’s all hocus pocus I know, but how fascinating! Ha! Lovely phrase, Pseu, I shall probably nick that one…. Phrenologists and fortune tellers? Even a broken clock is right twice a day. There used to be a shop in Oxford’s Covered Market that sold the head maps. I was tempted….once! i wonder if there are still people out there who practice, Laurence? I once knew a lawyer who read palms. Well, what are the chances of that? Something not very well known is the first name Charlotte went by: Caroline. Thanks so much, Luv! May we enquire if you have a blog? Would love to put the link up if you do…. Hi! No, I don’t have a blog but I might start something soon. Will let you know. I see no reason why shapes of the head should not reveal something about the person, just as handwriting does. People are also quite happy to see ‘alternative practitioners’ look for energy points of the body and so forth? I was aquainted with ‘Phrenology’ from an early age, having for fun learnt the Gilbert Bab Ballad of that title. ‘Observe his various bumps, his head as I uncover it; His morals lie in lumps, all round about and over it’ … It deals with Sir Herbert White complaining that he has been assaulted, but the phrenologist policeman eventually declares the assailant to be a saint and arrests White! Still chuckling over the ballad lyrics! Classic! Aren’t they lovely? That was always a favourite of mine, together with Yarn of the Nancy Bell and Gentle Alice Brown. Having spent much time recently reading about phrenology, I enjoyed this story very much, Kate. Ooooh! For a new project, Andra? With numerous crowns I wonder what my head would reveal? Quick, Tandy. Get thee to a phrenologist. Another fascinating post, Kate. Wonder what my bumps would say about me (most likely, there’s a gal who kept falling on her noggin’). Phrenology fascinates me. It’s right up there with the 4 humors in terms of odd science & medicine. But the concept of the 4 humors was around for a long time, whereas phrenology seems like they were just capitalizing on the VIctorian penchant for new “scientific” study. Having said that, the phrenology charts and models were works of art. Phrenology is just cool. Even if it’s all a load of hooey. It’s cool. And more of Charlotte and George in London! Hooray! Kate, it’d be easy to dismiss this “science,” but I do recall when two different psychics were spot on about something that (1) was about to happen – he even gave an exact date; and (2) another one touched on something that had happened – including something that had been written to me. Wowzer!